Mobcaster is another crowd-funding site, but specializes exclusively on indie produced television content. It has it’s own online TV channel (Mobcaster TV) – which will broadcast the funded shows’ series and will share ad revenue (50/50 net split) with the show’s creators. Mobcaster’s biggest success to-date is a show called The Weatherman (watch the pilot episode here). It not only surpassed its $72,500 goal, but it will get a distribution deal with TiVo’s digital streaming service. 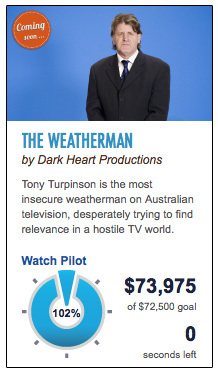 I watched The Weatherman pilot episode and it was really funny, well written and produced (by Dark Heart Productions). They are setting the bar pretty high for all the other proposed shows that will try to get funded through Mobcaster. If you have an idea for a TV show – go ahead and pitch it (free of cost) to the Mobcaster audience. Follow their steps: Pitch -> Fund -> Produce -> Broadcast.